Byron Willis was saved at the age of five and surrendered to preach when he was ten years old. At age 16, Byron started his first church in the small town of El Valle. He was married in 1987 to a Panamanian young lady named Briceida. 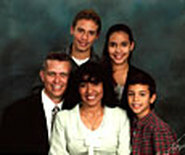 They moved to Texas and after a year of praying and seeking the Lord's will, went back to Panama in February 1989. Byron completed Bible college with Liberty Home Bible Institute through correspondence school.Byron Willis and his family started the David Bible Baptist Church in January 1993 in their own living room. The church has gone from an attendance of just the Willis family to over 600 in its sixteen years of existence. There have been over 1,000 public professions of faith and over 250 people baptized each year since moving into their own church building in November 1999, with many more saved through the soul-winning programs. This is now the fastest growing church in Panama and the largest Independent Baptist church in the country. He has also started a Bible Institute which is now in its eighth year.Bro. Willis’ desire is to see 30 churches established across Panama, one in every major town in the country. Those churches can then start reaching the many small villages that exist throughout the country. In 2009, Global Baptist Church Planters partnered with Bro. Willis to start three new churches in Panama.